Happy Thanksgiving! This is the third review I've published today of beers you should skip this holiday season. Festie, Southern Tier Harvest and now this one. I am, however, considering purchasing a Ralph Steadman print. What a fabulous artist. But for today, stick to my beer recommendations! BTW "Tonight" (below) is not "tonight"! 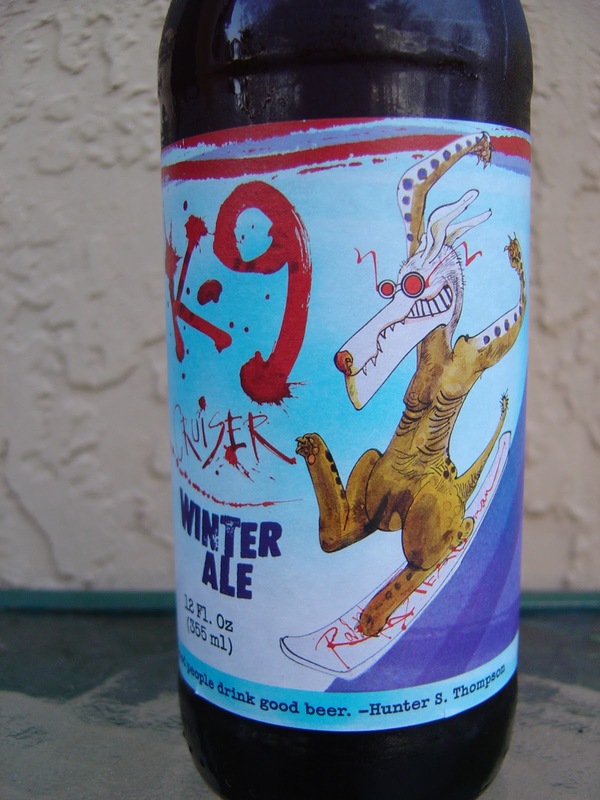 Tonight I'm drinking K-9 Cruiser Winter Ale brewed by Flying Dog Brewery in Frederick, Maryland. 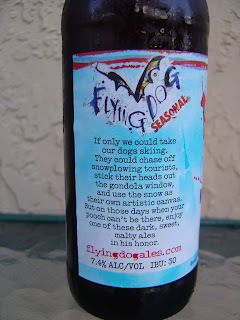 Psycho dog on the label snowboarding on one leg down a 60 degree slope. Nice shades too! 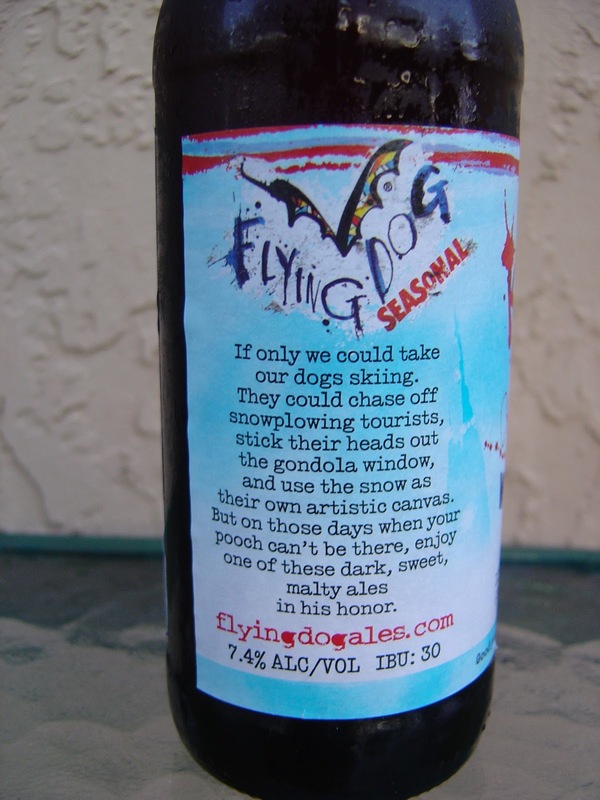 There is a wishful thinking story about what a dog could do for you on the slopes, see picture below. This guys has 7.4% alcohol and 30 IBUs. 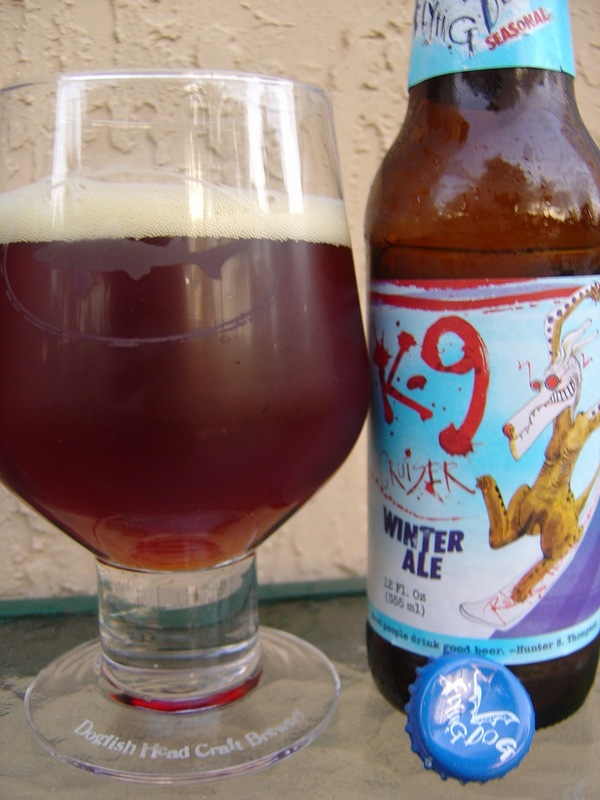 Nutty, herbal, malty, dark bread aroma. Not bad. Big prickly carbonation is what you get in the beginning, or at least what you'll notice most in your mouth. Malty, with a touch of bitterness in the background. Bready, herbal tea, cherries. There is also quite a bit of spiciness. After a few sips, the dominant flavor sticks out and it's just a weird medicinal thing. The alcohol is warming, as promised. More of the strange hits the palate in the finish. I can name six other beers from this brewery I'd rather have in my glass right now. What I'm saying is skip this guy! Cherry flavor in beer can be a killer. I feel like 90% of the time it just tastes like cough syrup, like you're kind of suggesting. Very few cherry flavored beers out there that I can say I enjoy.